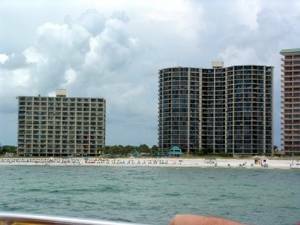 The Dunes of Panama Condominium Resort is on the quieter end of Panama City Beach. The resort contains over 1500 feet of private beach. The tropical grounds are beautiful. This is the perfect spot for a relaxing beachfront retreat or a fun filled active trip with tennis, fishing, swimming, volley ball, etc. The Dunes of Panama is proud to have the largest beach in the area.The Dunes of Panama offer three gulf side pools, lighted tennis courts, and large expansive sun decks. Suds Weezer is an onsite convenience store and cafe. The exercise facility and Suds Weezer are on the ground floor of our building, the beautiful E building. 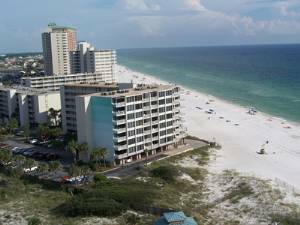 "Gulf Interlude" demonstrates why Panama City Beach is known as the place to be for "Real Beach Fun. There are two new children's play areas at the resort. Our unit is a quiet, serene oasis. The western facing balcony,directly over the aquamarine waters, provides fantastic views. 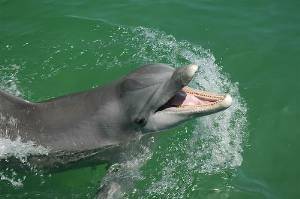 Dolphin, seagulls, and pelicans visit daily. Alfresco dining, quiet sunrise meditative moments or romantic evenings are perfect here.Gulf Interlude is decorated in updated, tropical beach decor. It is furnished to ensure that your needs are met. Your mind, body and spirit can experience an interlude to refresh and relax. Cheerful tropical colors of the surrounding sand and surf were the inspiration for the warm tropical colors guests find inside. New touches can be found in every room. Color is key. Crystal Aqua, Ripe melon,Tahiti blue and Sunburst yellow will help to energize and soothe. The living room is furnished with a queen size sleeper sofa, love seat and a comfortable, swivel chair positioned by the full sliding glass door. In addition to stero, guests can enjoy the large screen television and VCR/DVD player. The King size master suite is private and serene. The suite is spacious and attractively furnished with beautiful framed pictures by well known local artist, Paul Brent. The golden oak furniture is accented with the continuation of tropical colors including the new drapes that open to the walkout balcony. There is a 32" television in the master suite. 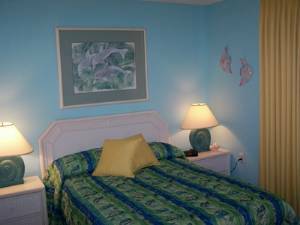 The second bedroom is a comfortable queen suite with updated beach furnishings and motif. There is a Northern view from this bedroom. Throughout the condo, the floors are a combination of quality berber carpet and natural stone tile. The kitchen is fully furnished including a washer and dryer in the pantry. The dining room table and breakfast bar will comfortably seat up to eight. Whether you choose to remain at the resort or to venture out to the numerous golf, dancing, boating and dining experiences available, Gulf Interlude is sure to please. Gulf Interlude is close to St. Andews State Park, Captain Anderson's Marina and the wonderful new shopping and dining spots on Thomas Drive. Of course, these days, a trip to the new Panama City Beach just isn't complete without spending some time at Pier Park. Our guests can easily get there anytime of year without being held up by the crowds frequently slowing down the Front Beach Road corridor. Many of our guests will be glad to know they can quickly get to the exciting games at Frank Brown Park also. Make reservations now, this is the perfect place to be when you're ready for a Gulf Interlude! Please ask about our returning guests discount. Suds Weezer Cafe and Convenience Store are on the ground floor. 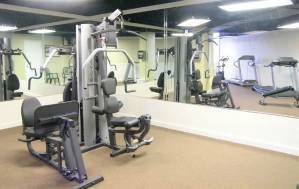 Exercise and Weight Room are also on the ground floor. The Dunes of Panama has a very active snowbird program during the Winter and daily activities for children during the Summer months. we had a great time in this well appointed condo. There were five of us. we enjoyed the condo, it was attractive, clean and had everything we needed. The internet was down for one evening but the people at Panama City Florida Resorts tried and did eventually help us to get it going. They were really helpful and always a pleasure to work with. This was our first time to stay with this outfit and we will be back. This was a fine experience for us. We stayed in Gulf Interlude for 7 days in April, My wife and 2 children and had a fantastic time. Nothing was wrong with the condo, it is beautiful, everything was in good shape and it was CLEAN. There is a awesome view from the balcony. The resort is one of the older WELL MAINTAINED places with larger units, more space and every thing you could want. We had wifi, everything under the sun on the beach right in front of the unit and with tennis game rooms, exercise place, store, cafe and several pools to choose from plus more it was really great. The people we rented from took care of us, everything was just perfect when we arrived, we got checked in quickly and got to the condo. we did need to call them one night because the wifi went down, there was a problem in the building but they were nice and it was back in less than an hour. We have stayed in lots of places in Panama but will certainly come back to this company and to this condo. Look forward to coming back in July. I have never been treated so poorly in all the years I have been renting condos at various beaches. These people wouldn't return my calls or repair things wrong with the unit that we reported upon our arrival, I had to call to get my security deposit refunded, they refunded to another person's card in our party, then refused to correct the mistake. Extremely rude!! There are so many beautiful affordable condos out there to rent. This is not one of them. I would like to add upon going to file a complaint against them with the BBB, I found they already had other complaints filed against them as well for billing issues...what a surprise. Stayed in this condo during our family spring break. Wonderful Beach decor. Views are to die for from the unit. Owner obviously takes great care of this home. We will be back ! We had a wonderful time in Gulf Interlude. Checking in was a breeze because the Panama City Fl Resorts staff were so courteous and had taken care of evreything before we arrived. We've seen several units at the Dunes of Panama and stayed in other resorts too but this condo was by far the best. The view is fantastic, there is plenty of room, everything we needed was in the unit including the well stocked kitchen. 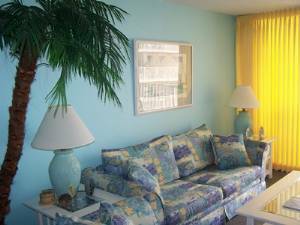 The condo is beautiful with framed Paul Brent pictures, good furniture, bright cheerful colors etc. we had a great time and we will be back! Thank You. 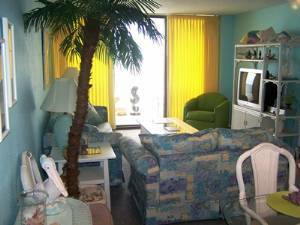 We absolutely loved staying in this beautiful condo for our March 2008 spring break vacation. 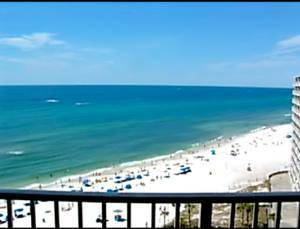 We have traveled to Panama City beach for several years and this is the first time we have stayed in a condo and we were so pleased with our stay. The check in was so easy, the condo was immaculate, the beds were comfortable, the views were breathtaking, and the owner was so attentive and went the extra mile to make sure our stay was stress free. Thank you so much for everything, we will definitely stay here again as soon as we can get away! Book this condo with confidence, you will not be disappointed! The Tingle Family. We had a wonderful time in this beautiful condo during our May visit. We are looking forward to another week in the fall. The unit is really pretty and as the Murray's wrote, it's obvious the owners have taken great pride in decorating and furnishing the unit. Deposit: 250$ refundable security deposit is required with every reservation.